HARLEM — It doesn't take much for Michael Reed to find a reason to stop by Tonnie's Minis on Lenox Avenue for a batch of cupcakes. Tonnie Rozier, 41, who opened the store just over a year ago, said he's often heard that since relocating from the West Village. Rozier started baking as a 7-year-old growing up in Harlem's Polo Grounds and even baked while playing college basketball. But Rozier's love of baking wasn't always a smooth ride; a professor in one of his college culinary classes said baking wasn't for him and a few years later, he lost his job as a social worker after demand for his cookies grew so large that his boss accused him of running a business at work. After filling a $5,000 baked goods order, Rozier left a job as a citywide recreation director for the New York City Housing Authority to take a shot at running his business full-time. "Everyone thought I was crazy but it was a true leap of faith," Rozier said. "When we came to Harlem, the mindset was that we would be different from the norm." At Tonnie's, patrons can get cupcakes made fresh to order, an idea Rozier got during the constant baking at his West Village shop just to keep with demand. "Our process here is different. 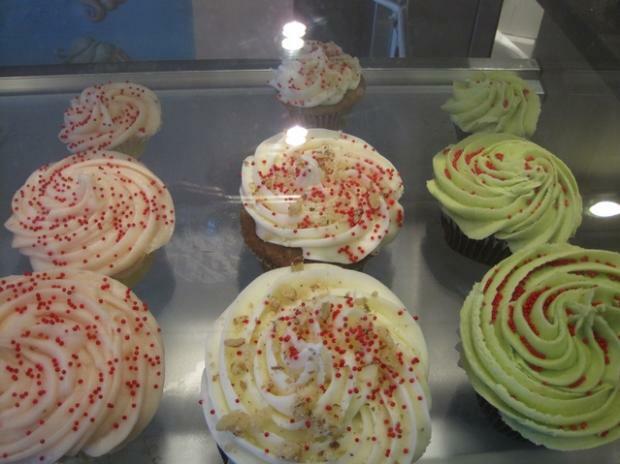 As we sell the cupcakes, we bake more so they are always fresh," said Rozier. Customers can order the sweet treats to suit their tastes; chocolate lovers can have chocolate cupcake with chocolate icing and Oreo sprinkles on top. Those who love candy can try cupcakes topped with gummy bears. And if you can't make up your mind, Rozier suggests the "fusion cup" — two cupcakes served with ice cream and toppings of your choice. But if you want any of the shop's signature carrot cake, make sure you come on a day when Rozier is present. The recipe is a closely guarded family secret that he's passing down to his son but won't share with any employees. The cupcake sizes range from the gigantic Hollywood to the small but tasty mini or cake shot, which Rozier often hands out as samples. "It's the cake. The cream is not too sweet like at other shops," said Todd Brown, 42, a cemetery worker, who came from the Bronx to buy his wife a birthday cake. "Whenever my wife has a craving, I have to come down here." Other customers spoke of being similarly mandated, one customer was buying cupcakes for a friend's sister who had survived cancer and another had brought his two daughters to his favorite cupcake spot for the first time. "It sounds corny, but this place is about family and friends. Everyone who comes here mentions how they get that feeling," said Lamond McDonald, 42, who has worked for Rozier for more than three years. "I love that he's in Harlem now because this is where he's from and this is where he belongs." Rozier feels the same way. When he first saw the storefront for rent on Lenox Avenue between 123rd and 124th streets, Rozier said he was reluctant to move because he didn't want to compete with a neighborhood favorite bakery, Wimps. But once he learned Wimps had closed he began to make his move back to Harlem. "There is a certain amount of respect with the bakeries. It's not just like opening a bodega," he said. Rozier said he welcomes the new restaurants and bakeries opening in Harlem. Levain Bakery is scheduled to open next month on Frederick Douglass Boulevard and Magnolia Bakery recently opened a factory at Park Avenue. In East Harlem, the Hot Bread Kitchen incubator at La Marqueta could flood the area with a slew of new oven fresh culinary delights. On any given night, Rozier said he gets a lot of traffic from people who are headed to Marcus Samuelsson's Red Rooster Harlem restaurant. Rozier said he just scored a major restaurant order and is already thinking about expanding. "Harlem is a place that is quickly growing and its only going to help propel us all," said Rozier. "I'm confident. I'm not saying I'm the best, but it is what it is."